In January, our guild had an “Out with the old” challenge, where we were to use up some of the oldest fabric in our stash. 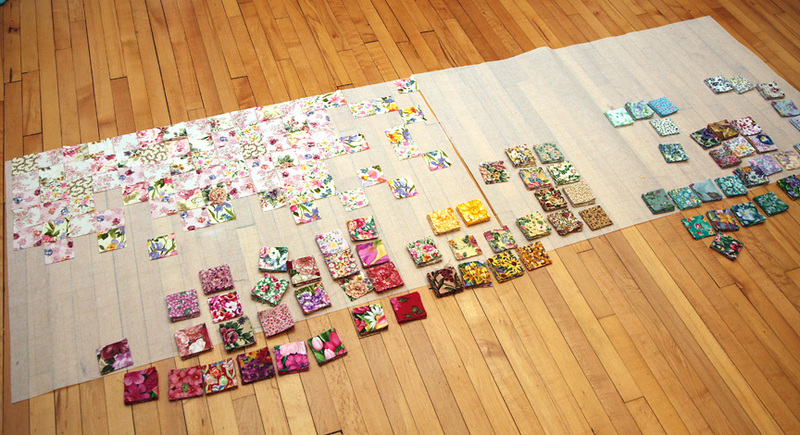 Back when I first started quilting (I think around 2006), I bought four packages of 100 floral 4″ charm squares on eBay. The person selling them was putting them up for bids and they were going ridiculously cheap. Then, I had my daughter, moved to a different state, etc. etc. etc. and never got around to making a quilt with them. By the time it was a few years later, my tastes had changed, and I realized that these fabrics weren’t the greatest quality and I wasn’t really sure what to do with them. So I stuffed them into the back of the closet and forgot about them. When I was digging through my old fabrics for this challenge, I came upon them and I thought “Why not make this even harder on myself? 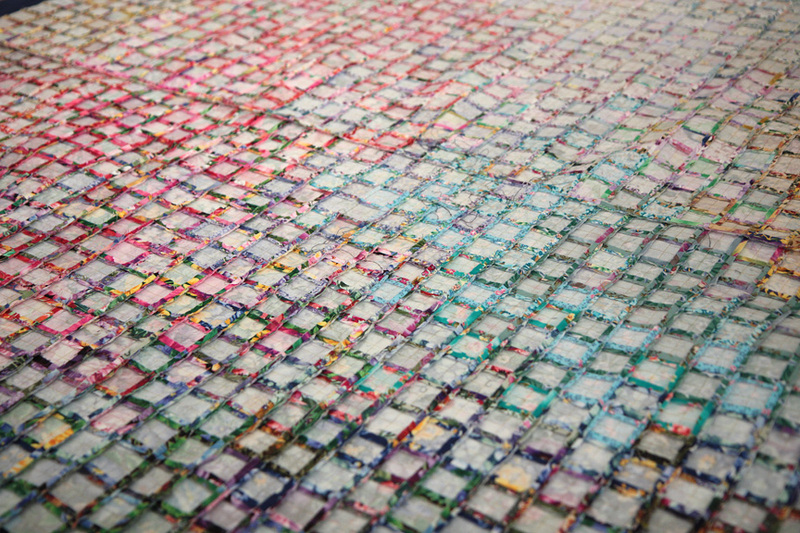 I should cut each 4 inch square into four 2 inch squares!” (Ha ha.) 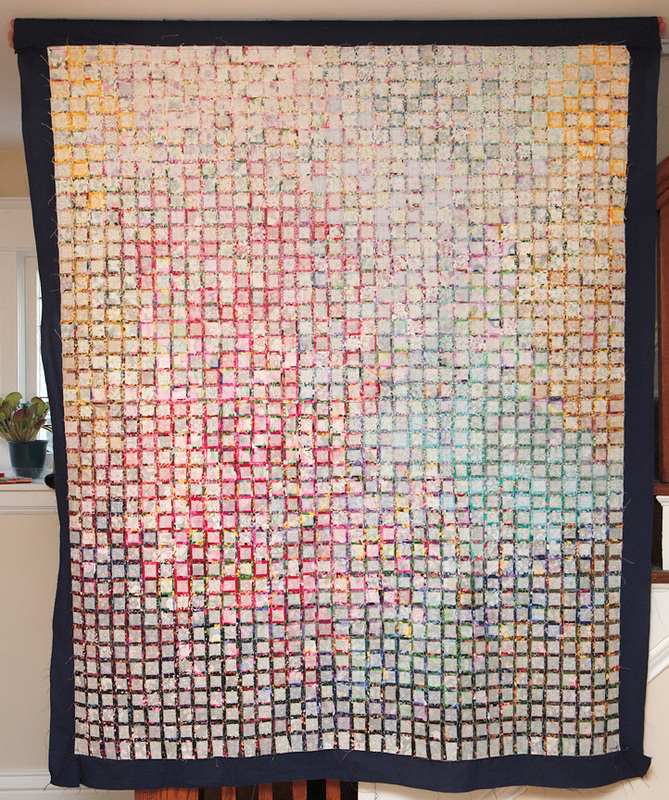 I wanted to do a watercolor-style quilt, and the 4″ squares were too big. Laying out the first of 1584 squares on the first two of eight panels. I got some “Quilter’s Grid” from Jo-Ann’s with a coupon. If you have never seen it, it is a medium-weight fusible interfacing with a pre-printed one inch grid on it. You can’t see the grid in the above photo because it is fairly faint. I had seen a quick way to sew it together on the Internet where you fuse down all the squares, then fold the interfacing to sew all the horizontal rows together. You take scissors to snip open the seams and press them all open (I cheated and took an extra-wide seam and then cut them open with a rotary cutter). 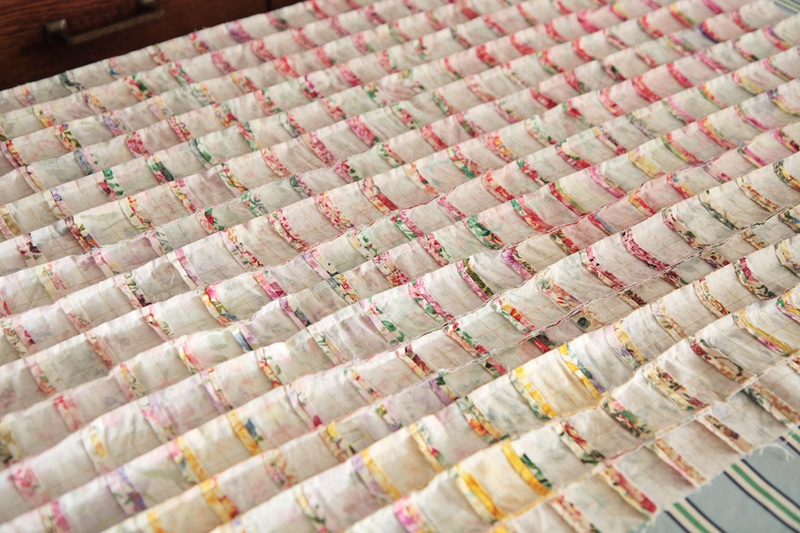 You then sew up the vertical seams, cut them open and press the seams open. 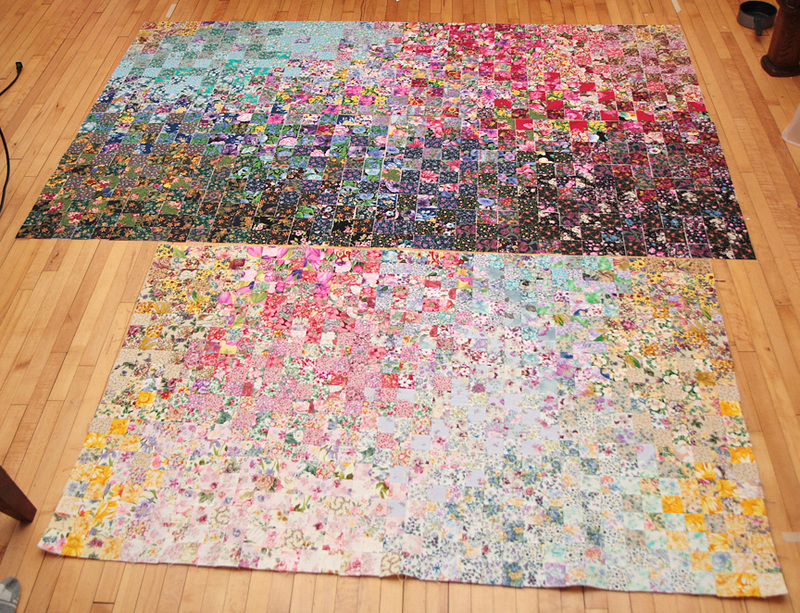 I didn’t want to have the whole gigantic quilt all fused together in one piece, so I did it in eight smaller panels. 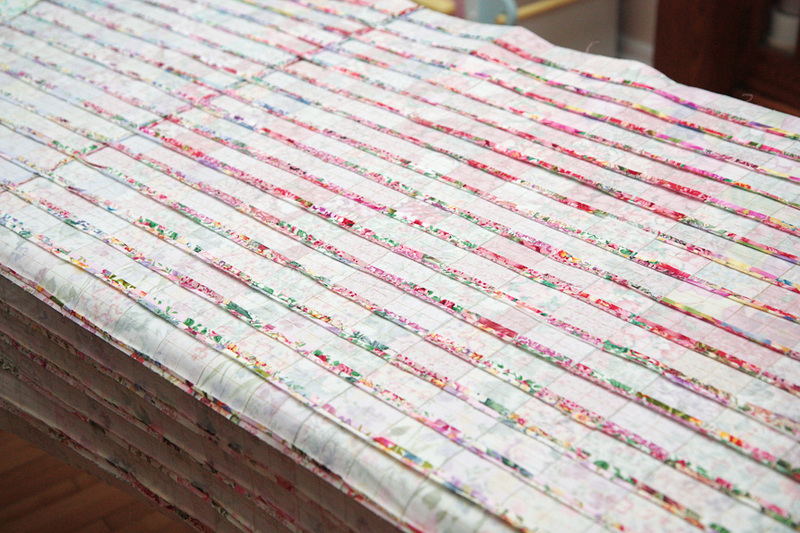 My seams were not perfectly even, so at the end when I was basting the quilt was a little buffl-ey because of the extra stiffness. After the first set of horizontal seams sewn, cut and pressed open. After the vertical seams were sewn, but before cutting apart. Look at how much such tiny pieces shrink! The bottom panels started out as wide as the top panels. After I laid it all out, I decided that the line between the dark and the mediums was too horizontal, and I spent an hour pulling little squares off the interfacing and re-fusing them. It wasn’t hard, just annoying. Finished top from the back. It looked so pretty held up to the light! 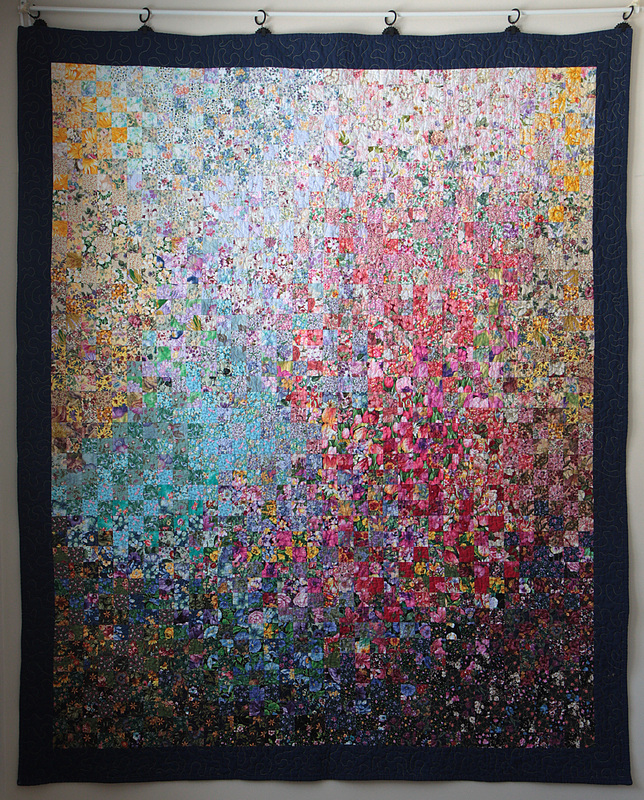 What a beautiful quilt. 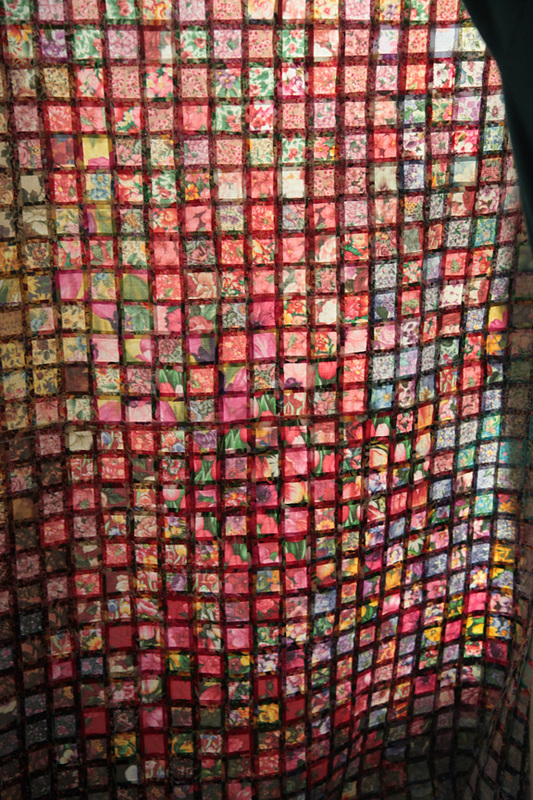 I’m doing a small project with .75 inch squares. Hoping Quilters Grid makes one that small! Thanks or sharing.